As in previous years, the tenth anniversary edition of DNES Marketing’s SXSW Takeover is set to bring fans the most dynamic Hip-Hop performances to hit Austin this week, with a variety of buzzworthy artists in the game currently over the course of three days. The event kicked off, Tuesday, March 13, with The Nxt Gnrtn Takeover, a celebration of the brightest up-and-coming stars in the game including 24hrs, Buddy, Yung Pinch, YBN Almighty Jay, The Good Perry and more. Presented by Lugz, Day 1 of the SXSW Takeover will take place at Ironwood Hall, located at 505 E. 7th St. Doors open at 8pm. 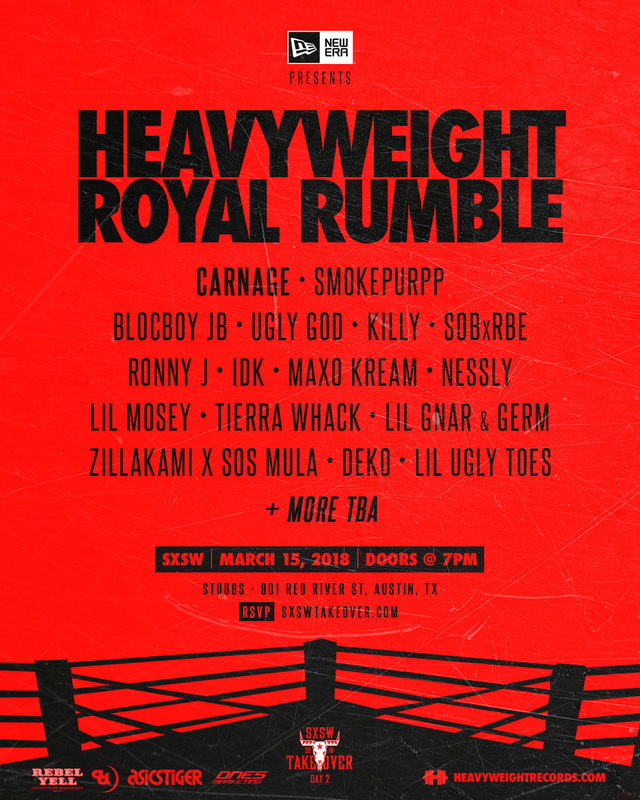 On Thursday, March 15, the SXSW returns to the legendary Stubbs BBQ, which played host to the concert series last year, for the Heavyweight Takeoverpresented by New Era Cap. Day 2 will showcase a variety of artists who have, very quickly, made a name for themselves and established a strong fanbase thanks in no small part to their unique styles, including performances by Carnage, Smokepurpp, Blocboy JB, Ugly God and more. The Heavyweight Takeover is sponsored by ASICSTIGER and Rebel Yell. Stubbs is located at 801 Red River St. Doors open at 7pm. 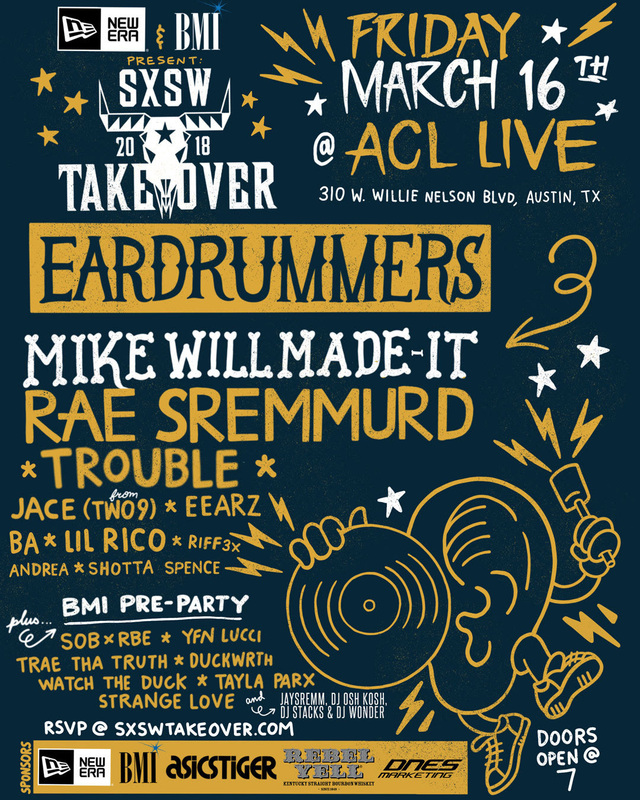 The SXSW Takeover will close out 2018 with the Ear Drummers Takeover on Friday, March 16. Presented by New Era Cap and BMI, the show will also serve as a celebration for Rae Sremmurd’s highly anticipated Sremm Life 3. The duo will, of course, be joined by members Ear Drummers family, including Jace of Two9, EEARZ and Mike Will Made It himself. In addition, Day 3 of the SXSW Takeover will feature performances by Lil Xan, YFN Lucci, Trae The Truth, Watch The Duckand more. Day 3, sponsored by ASICSTIGER and Rebel Yell, will take place at ACL Live/Moody Theater, located at 310 Willie Nelson Blvd. Doors open at 7pm. Since 2008, DNES Marketing’s SXSW Takeover has delivered some of the biggest Hip-Hop moments at SXSW including the 2012 Shady 2.0 Showcase featuring 50 Cent and Eminem and the 2013 Mass Appeal Ice Cream Social featuring Kendrick Lamar and Bun B and 2014’s Mass Appeal x Grooveshark SXSW Takeover featuring Nas, Flying Lotus and more. In 2015, the SXSW Takeover presented J. Cole’s Dreamville Takeover; and in 2017, SXSW Takeover presented Gucci Mane’s highly anticipated return to Austin and an SXSW debut by Cardi B. 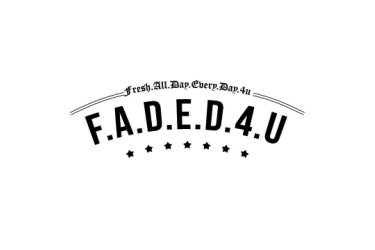 In addition the showcase was influential in breaking new and upcoming artists including Dej Loaf, 21 Savage, Lil Uzi Vert, G-Eazy and more.